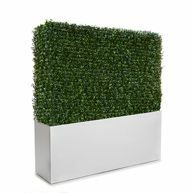 Standard and custom artificial boxwood and shrubbery add appeal and convenience to any home, business or commercial establishment. 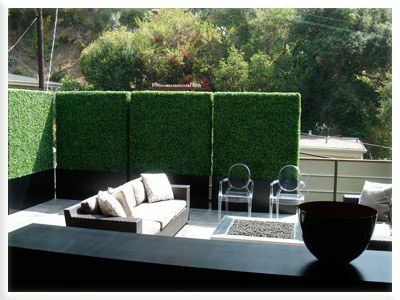 Privacy hedges are perfect to cover unsightly views for customers or visitors while simultaneously making an area more private and secluded for those relaxing. 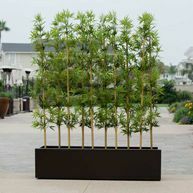 These decorative plants are hand assembled to an iron grid cage using steel clasps and commercial grade, color matched zip ties. 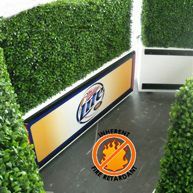 We also custom fabricate planters these faux hedges can be bolted to for a complete and finished look. 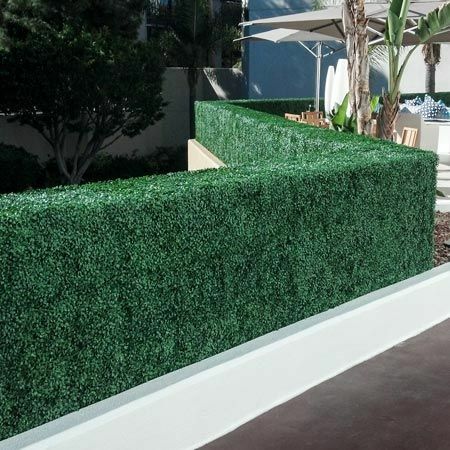 Our outdoor shrubbery panels are made from a blend of high quality polyurethane that has the UV protection impregnated directly into the resin for maximum life before fading. 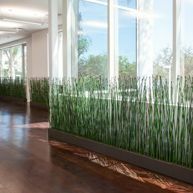 Less expensive imitation foliage material has the sun protection sprayed on and this has the tendency to wash off or burn away quickly. Available in standard and custom shapes and sizes, our outdoor synthetic hedges - including ivy and azalea varieties - withstand the test of time. 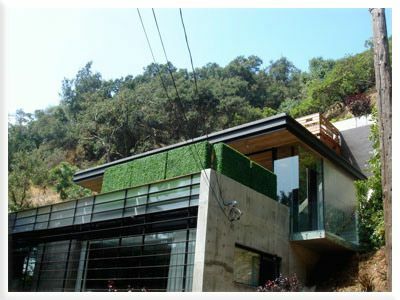 Their fade-resistant beauty requiring no maintenance, saving you money and elevating your design. 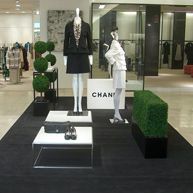 Outdoor Artificial Flowers | Outdoor Artificial Bushes. If your design calls for indoor fire retardant plants, see our collection of Fire Retardant Trees and Foliage to suit any space. 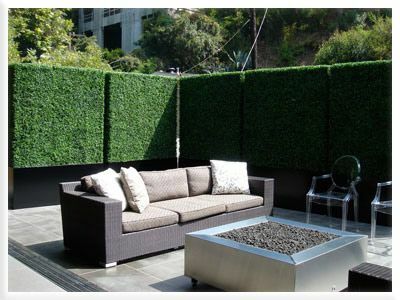 You can use commercial-quality imitation plants for privacy screens to convert any urban setting to a secluded, modern courtyard. 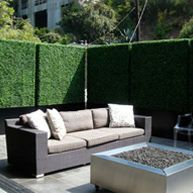 This Beverly Hills home patio just became a little more exclusive with the simple addition of outdoor synthetic hedges. 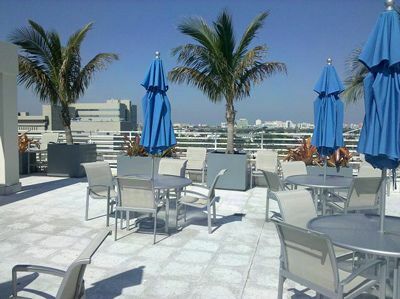 A major hotel chain in downtown Miami had a challenge - a rooftop swimming pool that overlooked some unsightly construction material and scrap on the vast rooftop beyond. 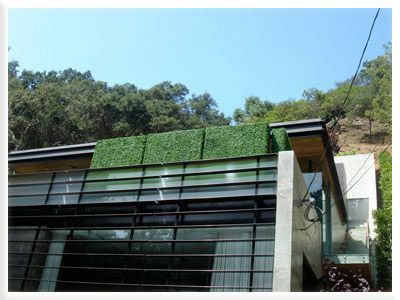 We developed a manufactured foliage privacy screen that hung over their already installed railing to block the view of the debris, yet preserve the city skyline and ocean/bay view. Coordinating site furnishings also available by request.